London — Using a new bug spray on bed nets that blocks mosquitoes resistant to current insecticides almost halved malaria infections among children in Tanzania in a study that has boosted hopes of protecting more people from the killer disease. A trial by the London School of Hygiene & Tropical Medicine involving 15,000 children found using a bed net treated with piperonyl butoxide reduced malaria infections by 44 percent in the first year compared to nets only treated with pyrethroid. The study comes amid concerns that mosquitoes' ability to resist insecticides is evolving rapidly and spreading across Africa where tools such as insecticide-treated bed nets and insecticide spraying have helped cut malaria cases since 2000. The trial prompted the World Health Organization (WHO) to revise its recommendations and back wider use of nets sprayed with piperonyl butoxide in areas in Africa where mosquitoes are pyrethroid resistant. "It's imperative we try and remain one step ahead of insecticide resistance which threatens to reverse the great gains made in combating malaria," researcher Natacha Protopopoff from the London School of Hygiene & Tropical Medicine said in a statement. 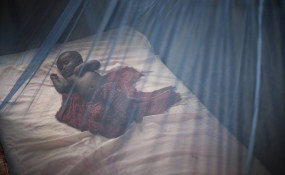 For although the malaria death toll fell by 62 percent between 2000 and 2015, there were still an estimated 445,000 deaths in 2016, according to WHO data, with most deaths in children under five in the poorest parts of sub-Saharan Africa. For the first time in years the WHO reported an increase in malaria cases and no change in the death toll in 2017. Overall funding for malaria has levelled off since 2010, totalling about $2.9 billion in 2015 but the WHO says a minimum annual investment of $6.5 billion is needed by 2020 to meet targets on controlling malaria by 2030. Protopopoff said the study in Tanzania involved 48 villages in an area in the north west where high levels of resistance to pyrethroids have been reported. Mark Rowland, principal investigator from the London School of Hygiene and Tropical Medicine, described the trial as a "game-changer" that could help community protection. "This will ensure insecticide treated nets will remain an effective intervention for malaria control, and justify the continued investment and research on alternative insecticides for use on nets," he said in a statement.